I'm not usually one for a romantic, nostalgic book but give me some time-travel and I'm in. This book is a little gem, filled with surprises. It has a refreshing almost innocent quality about it. While we are being barraged with erotica and risqué novels, which shock for the sake of shocking. The Vintage Coat gives us romance, adventure, family ties, friendship and sacrifice. 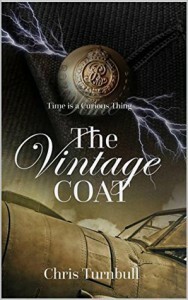 The concept of a time-travelling coat is unique and is a testament to the authors originality and imagination. The book is extremely well researched and written. The plot is engaging and entertaining. It reminded me of watching old black and white movies on a Saturday as a child with my parents, somehow comforting, familiar and yet at the same time new and exciting. I won't delve into the plot and give anything away, have a read and see for yourself.